Like everyone, I tend to come up with a lot of ideas that I never get around to doing. Sometimes out of laziness, sometimes because I can’t figure out how to make it work, and sometimes, it’s just because they’re pretty stupid ideas. If anyone wants to make these stupid ideas a reality, more power to you — maybe give a hat-tip to Kittysneezes, why don’t you? Stupid Idea: I’d like to make, or see, whatever, a movie that’s basically a lowest-common-denominator type of comedy. Sort of like a David Spade/Chris Farley type of movie — pretty base humor and all that. Now, I’m not being on a high-horse or anything like that. 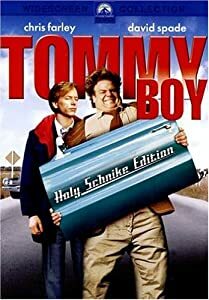 I’ve seen Tommy Boy about a million times and I still laugh. “Fat Guy in a Little Coat”, no matter how stupid, is pretty damned hilarious. But anyway, the TWIST: So, everything in it would be that sort of movie. Played completely straight, or however you would describe it. Like, the script, the direction, the acting — there wouldn’t be anything to distinguish it from something like Black Sheep or Happy Gilmore or anything. The one exception: The score. The score would be a creepy ambient noise sort of thing, like out of Eraserhead. Lots of industrial sounds, buzzing, all that sort of stuff. Speaking of Eraserhead, did I ever mention the time I came back to my old apartment after a screening of a brand new 35mm print at the Northwest Film Forum? (Beautiful, by the way — the DVD is super awesome, but to see it in 35mm is amazing.) My old apartment was in a former hotel from the 1920s… and walking in the building and down the halls, I was completely attuned to all the sounds I’d normally filter out…. the lights buzzing, the pipes clanking, all of that. It was, well, creepyawesome. But anyway: The late Chris Farley in a film with the late Alan Splet doing the sound. Or, rather, their non-dead equivalents. That would rule. Could someone either make that happen, or give me the money to make it happen? Someone, get Lorne Michaels on the phone. But probably hit him in the head first so he won’t realize what he’s making. Why I Never Did It: Both Chris Farley and Alan Splet are dead. And I don’t have money or access to Lorne Michaels.